During World War II, the boiler room under Harvard's Memorial Hall was turned into a secretive wartime research lab. Here, volunteers were subjected to hours of noise as scientists tested military communications systems. Out of this came the Harvard sentences, a set of standardized phrases still widely used to test everything from cellphones to VoIP. Few know about the sentences themselves other than speech scientists and audio engineers, but the technologies they've helped build are everywhere. Verizon's real-life "Can you hear me now?" guy uses them. Speech-to-text software engineers use them. Speech scientists studying cochlear implants say them out loud all the time. "These materials have been the gold standard," says David Pisoni, director of the Speech Research Laboratory at Indiana University. But first, perhaps you'd like to read some more of the sentences. At least one contemporary called S.S. Stevens's Harvard Psycho-Acoustic Laboratory "an inferno of sound." The lab was devoted to understanding how humans perceived and reacted to sound—all with eye toward aiding military communications. One study, for example, subjected volunteers to seven-hour work days filled with airplane noise for a whole month for the purpose of studying acoustic stress. An early spectrometer at the Psycho-Acoustic Laboratory. Credit: Stevens et al. The Journal of the Acoustical Society of America. 1947. But science requires standardization, so the researchers at the Psycho-Acoustic Lab set about molding the English language into discrete and standardized chunks. They developed word lists that were phonetically balanced, meaning that the frequency of sounds in these lists matched that of natural language. If you used these words, you were sure to hit all the noises a person would typically hear in a conversation. The researchers then moved on to phonetically balanced sentences, our Harvard sentences. The sentences are deliberately simple and short—monosyllabic words punctuated by exactly one two syllable word sentence. Some garbled version of the sentences would be played on tape, and volunteers attempted to make sense of what they heard. The idea was to test how much a person could mishear before they lost the meaning of a sentence. After the war, the lab's once secretive research slowly disseminated into the wider scientific community. Stevens, the lab's founder, became one of the most eminent psychologists of the 20th century. Leo Beranek, a longtime collaborator with the Psycho-Acoustic Lab, became a notable acoustics expert, famous for building the first anechoic chamber and designing music halls. "Tea soaked in Lebron James is tasty"
The Harvard Sentences were eventually widely published as part of the IEEE Recommended Practices for Speech Quality Measurements, which is where I first encountered them. The sentences had been revised since the war, and they number 720 in all—72 lists of ten sentences each. I quickly discovered I wasn't the only one drawn to the sentences. Artist Chris Toalson had carved a list of ten sentences one by one into linoleum blocks, printing them as postcards—a play on the sentence's importance in the history of communications. "Amidst a culture obsessed with tweets, text messages, and status updates, communication via postcard seems archaic at best," he writes in an artist statement. "The sentences themselves evoke nostalgic feelings for a simpler bygone era. " Indeed, the old-fashioned fussiness of the sentences can sound funny to modern ears, especially when they're deliberately used in situations that make them hard to understand. "We have all our favorite sets," said Matthew Winn, a postdoctoral researcher at the University of Wisconsin-Madison. "We keep track of really common mistakes." Winn's most memorable? 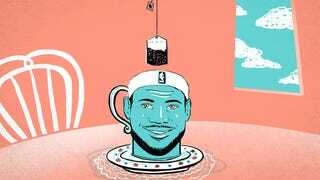 "Tea soaked in Lebron James is tasty," a mishearing of "Tea served from the brown jug is tasty." For what it's worth, our Skype connection was not great, and when Winn recounted the anecdote to me, I misheard it as "Teeth soaked in the brown jug is tasty." So the Harvard sentences are still useful as a means of testing acoustic quality, even now. The Harvard sentences aren't just an obscure tool for scientists or a curiosity for nerds like me—they're also used out in the real world. The best example might be Verizon. You remember those "Can you hear me now?" ads that were ubiquitous a few years ago. The real-life version of that guy uses Harvard sentences. A Verizon baseline engineering testing network quality before crowds descend on the Daytona 500. Verizon. Verizon's baseline engineers, as the job is called, drive thousands of miles a month to test the network quality. Their trucks are outfitted with computers that blurt out a Harvard sentence every 15-30 seconds. "He carved a head from the round block of marble," the Verizon computer will say. Or: "These days a chicken leg is a rare dish." Verizon spokesperson Chuck Hamby told me that the software was created about a decade ago when this networking testing program first began. Naturally, the Harvard sentences were chosen as the corpus of test words. "Some of them are just a hoot," he said about the sentences. Seventy years ago, researchers tinkering in a basement lab probably could not have foreseen the vast communications network that exists today. We've found ever more ways to scramble voices into signals to carry over ever longer distances, but we face an age-old problem: Those voices become hard to understand. But standing between us and mutual unintelligibility is a set of funny, fussy sentences that sound almost like poetry.